Howard B. Abikoff, PhD, is Professor Emeritus of Child and Adolescent Psychiatry at New York University (NYU) Langone Medical Center. Previously, he was the Pevaroff Cohn Professor of Child and Adolescent Psychiatry and Professor of Psychiatry at NYU and Director of the Institute for Attention Deficit Hyperactivity and Behavior Disorders at the Child Study Center of Hassenfeld Children's Hospital of new York at NYU Langone. For more than 40 years, his work has centered on the development and evaluation of assessment measures and treatments for children with attention-deficit/hyperactivity disorder (ADHD). Dr. Abikoff has published over 165 papers, chapters, and reviews, and serves on the editorial boards of numerous psychology and psychiatry journals. 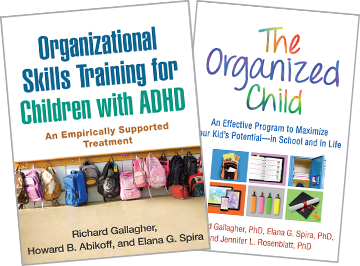 With Richard Gallagher, Dr. Abikoff coauthored the research manual on which this book is based, as well as the Children's Organizational Skills Scale.